Build and create your world, that might remind you a game, except this time you can do it in the LEGO Worlds as announced by Warner Bros. and TT Games. It's up on Steam early access, trailer and screens inside. Burbank, Calif. – June 1, 2015 – Warner Bros. Interactive Entertainment, TT Games and The LEGO Group today announced LEGO® Worlds, a limitless collection of procedurally generated worlds made entirely of LEGO Bricks, where players build unique environments and define their own experience. 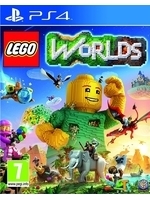 Developed by TT Games, LEGO Worlds allows players to use LEGO building sets digitally so they can build and create wherever their skills and imagination roam. In LEGO Worlds, players have the freedom to alter procedurally generated worlds and create anything they can imagine one brick at a time, or use prefabricated structures to customize their environments. Large-scale landscaping tools are available to modify terrain quickly and easily. Entire worlds and creations are brought to life with characters and creatures that interact with each other as well as the player in unexpected ways. From helicopters to dragons, motorbikes to bears, there are always interesting ways for players to explore the vast worlds and discover hidden treasures. Fans of the LEGO building sets will be rewarded with a select number of commercially available sets that can be unlocked in-game during Early Access, with many more to come in future game updates. Future plans will also offer multiplayer and sharing features, for friends to experience each other’s worlds and show-off their creations. Went straight to Steam when I heard about this. No Mac version. Foiled again.